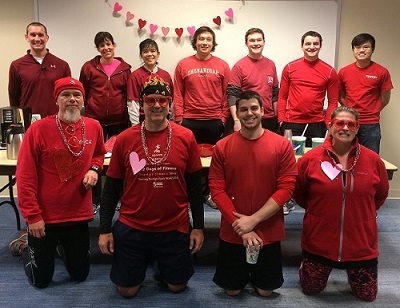 Last night I dropped a check into my son’s school’s American Heart Association Fund Raiser and this morning we kicked off #NationalWearRedDay at the RFC with our annual Wear RED for Heart Health Breakfast Run. What’s the deal with all heart health awareness this month? Not only is it the #1 killer in America, heart disease is at the top of my list as to reasons why clients come to see me when referred by a doctor. High blood pressure or high cholesterol combined with an inactive lifestyle, regular stress, and a family history of heart disease puts these folks (and me!) at an increased risk for heart attack and stroke and that’s scary stuff! Whether or not you put yourself in the “increased risk” category, heart disease is a big deal in America. About 1 in 3 adults have at least 1 type of cardiovascular disease resulting in nearly 1 billion dollars a day that we spend on heart-related health care expenses. (Center of Disease Control) Numbers aside, heart disease is no fun for anyone as it creates emotional stress and physical limitations. To reduce your risk for heart disease, exercise and healthy diet are always recommended, but, did you know that stress also plays a major factor into heart health? When you are stressed, your body reacts by releasing adrenaline which temporarily increases your breath rate and blood pressure preparing you to “make a run for it” or “fight” – the fight or flight response. When the stressor dissipates, your body stops releasing the adrenaline and goes back to normal operation. However, with prolonged stress, your body remains in this stimulated state which stresses your heart and may displayed in the form of headaches, stomach pain, neck and shoulder or low back tension, gastric distress, and/or sleep disorders. 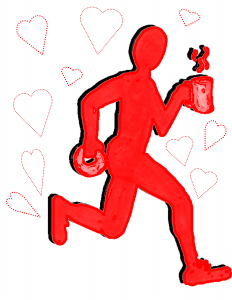 Your sweet little heart is trying to keep you going, but like all things, the heart – your heart – needs both periods of stimulation (exercise) and periods of rest. When adrenaline is pumping through your body, you heart continues to push harder to “keep you alive” but, despite all our efforts, we can’t run for forever. Deep breathing. I love this one! Have you ever noticed when you’re feeling anxious or stressed that you are breathing quickly (from that adrenaline) or holding your breath. We have the power to alter our breath and by doing so we can both slow down (and speed up) our heart rate. Take your breath off autopilot for a moment, close your eyes, and take five full, deep breaths. Silence. My days are packed full of excitement, busy-ness, and noises from my little guys, cardio machines, music in the studio, and constant conversations. While tempting as it is to hop in the car and jam out on the way home or get caught up on my podcasts, on particularly busy or stressful days, I treat myself to a silent ride home. Couple that with deep breathing and I’m refreshed and ready for mommy-detail by the end of carpool. Play Worst Case Scenario. Consider what is causing you stress and anxiety and then ask yourself “what’s the worst that can happen?” Keep asking the question until you truly get to the bottom of it. We talk ourselves into stress, overwhelm and feelings of anxiety on a regular basis, but, when you truly consider the worst case, it’s likely that you will still be alive and healthy and moving forward and if not, then it likely is something that you need to prioritize. 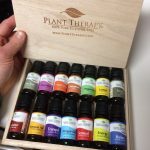 Take a whiff of a calming essential oil like Lavender or a synergistic blend like “Stress Relief.” During the last couple years I’ve been experimenting in the holistic practices including essential oils (E.O.s) At this point, I use E.O.s mainly for pain relief, migraine management, muscle recovery, and as a sleep aid and the results are amazing! Each E.O. has unique properties and are generally categorized as stimulating or calming. Lavender is an excellent “calmer” and is great for stress relief and promoting restful sleep. All you have to do is open the bottle and take a whiff or dab a drop onto your hands or temples. Inhale calm, exhale stress! Take a bath. Yes, I know, who has time for that? But really, a warm bath is a great way to relax. The warmth and weight of the water are both very soothing. Submersion in water reduces blood pressure and your heart does not have to work as hard. The humid air above the bath helps to open up your sinuses and breathing is less labored. Add a couple drops of lavender essential oil and Epsom salts and soak that stress away. BONUS! The magnesium in the Epsom salts will help melt tension in your muscles and help you get a great night’s sleep! Feeling stressed or overwhelmed? That stuff is not good for your heart! Instead, take a break, take a deep breath and relax! What's the worst that can happen?